Kink BMX bikes are known for their durability and stability on and off the road. With the Kink Curb 2013 BMX bike, this is no exception. The bikes low-profile allows for easy mounting and dismount of the bike, while the build itself is perfect for all skill levels. Even beginners will find it easy to maneuver and direct this low-profile bike. With endorsements from some of the most popular riders in the world and riding programs and events like the Dew Tour, X-Games, and features in magazines and videos across the globe, the King Curb 2013 BMX bike is a product with a reputation for excellence and quality. As aforementioned, one of the greatest aspects of the Kink Curb 2013 BMX bike comes from the fact that it is at a height that is easy for riders of varying ages and abilities to get on as well as rise. The durability of the steel frame with its high-tensile structure gives it the durability that Kink BMX bikes are known for. This means that it will last longer than a bike structured and created from less impressive and sustainable materials. Color options available in orange and blue, there is a bit of customizability that can come from this model of the Kink BMX bikes that makes it more appealing to the visually particular. A lightweight construction at only twenty-five pounds means that the bike can be moved with little effort and transported with ease, making it great to take on vacations, to events, or in any other travelling choices one makes. 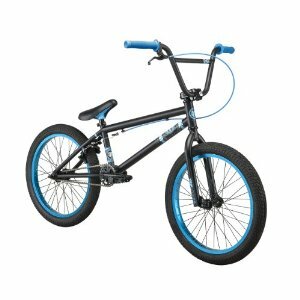 The only negative that seems to be associated or discussed with Kink Curb 2013 BMX bike is that it is best suited for beginners rather than the more advanced BMX riders. This can be a limitation in that experienced riders will find the ride less than ideal. However, if this is the case, there are several other Kink BMX bikes available for the more advanced rider that can be opted for rather than this beginner bike. It is important to understand the level of need and the level of riding experience before a customer chooses the best bike for them. The Kink Curb 2013 has a brand name that is reputable and the backing of several great performers in the BMX biking world. For this reason, it is a great option for those looking for a bike that stands out and can be used for years after purchase. The price ranges in the mid to higher two-hundred dollar range and is a great option for the new rider looking for a bike that they can grow with. A light weight and durable construction should make this bike a top contender for those looking to advance their BMX knowledge and riding experience. This entry was posted in Bikes, BMX, Kink, Reviews and tagged Kink BMX Bikes, Kink Curb 2013 BMX Bike. Bookmark the permalink.